The January transfer window will soon be closed, to the relief of many managers given that a number of Scottish-based players are attracting admiring glances. It's a case of now or, well, the summer for clubs looking to strengthen for the season run-in or those looking to profit with players' contracts running down. In Scotland, the days of high-profile deadline-day transfers are now few and far between. Yet in this window there remains interest in a number of players at leading clubs. The France Under-21 striker's situation at Celtic is somewhat curious. Injuries have hampered his progress this season and Celtic manager Brendan Rodgers admitted that transfer speculation affected his player. As a result, Dembele has been a peripheral figure in recent games. Leigh Griffiths' latest injury setback may have ensured that his fellow striker remains at Celtic Park, unless a replacement has been lined up. 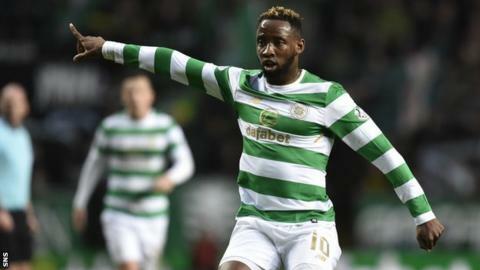 The other issue is whether any club would meet Celtic's valuation, with Dembele's recent fitness questionable and his goal return not as impressive as last season. Dembele has more than two years of his contract to run, so there's no immediate pressure on Celtic to sell. What seems clear is that Dembele ultimately sees himself performing at a higher level, and may feel that time has come to move. The club has rejected one offer, with Rodgers adamant that the striker has not asked to leave. It may be a case of getting through this window and refocusing the player for the remainder of the season. Dundee defender Hendry has already been the subject of a bid from Celtic, which was rejected out of hand by the Dens Park club. The 22-year-old centre-half has been a mainstay of Neil McCann's defence since singing on a free transfer from Wigan last summer, and his physical presence and composure on the ball are qualities that have caught the eye of several clubs. Hendry moved from Partick Thistle to Wigan in 2015, where he was signed by former Scotland defender Gary Caldwell, but failed to make the breakthrough at the DW Stadium. Loan spells at Shrewsbury and MK Dons preceded his return to Scotland on a two-year deal, and playing consistently has brought the best out of him. There seems a determination to retain him at Dens, or at least hold out for a significantly higher fee than has been offered so far. Lafferty seemed quite a coup for Hearts when he arrived last summer. The Northern Ireland international was courted by Hibernian, but opted for Tynecastle instead. The recent arrival of Steven Naismith on loan at Tynecastle until the end of the season perhaps leaves Hearts more open to offers for the 30-year-old striker. Isma Goncalves' departure to Uzbekistan does leave Hearts short of attacking options, but manager Craig Levein is likely to add in that area with Cole Stockton also having moved on to Carlisle United. Lafferty started well in Edinburgh, scoring four goals in his first three games in the League Cup group stages. He's netted 11 times in total, but an attractive offer may prove tempting if Levein has someone lined up to replace him. The former Rangers striker is likely to command a significant salary, which Hearts may feel can be utilised more effectively. For all of his undoubted ability, Stokes does appear to carry some baggage. He seemed to be a significant signing for Hibernian last summer but has been a peripheral figure, and occasionally making headlines for the wrong reasons. Hibs manager Neil Lennon knows the forward well, having worked with him at Celtic, but he appears to have run out of patience. English League One side Charlton Athletic made an approach to recruit the striker, while a Polish club are also believed to be interested. This is Stokes' third spell at Easter Road, and he'll forever be remembered by the Hibs fans for his double against Rangers in their 3-2 Scottish Cup final victory of 2016. Lennon refused to speak about the player's future at a recent media conference. As one of the higher earners at the club, Hibernian may have determined that Stokes is a luxury they can ill-afford. If there's a firm offer, it seems Stokes is likely to depart. It does seem a case of when and not if John McGinn moves to a new challenge. It may not happen in this window, but he's capable of playing at a higher level and it seems many clubs agree. The midfielder is contracted until mid-2019 and unless Hibernian can extend that deal, they run the risk of receiving less than they might come the summer or a year down the line. Perhaps admirers may wait beyond this window with that in mind. Despite his experience, the midfielder is only 23 years old. McGinn has five Scotland caps and will look to establish himself as a mainstay in midfield for the national team in the coming years. Last summer, the Easter Road club rejected an offer of around £750,000 from Nottingham Forest for the player. They wouldn't let him leave cheaply but cashing in on a good offer, given his contract, may well prove tempting. Scott McKenna is another young Scottish centre-half who is making an impression. Hull City have already had bids rejected by Aberdeen, with the Pittodrie club's manager Derek McInnes adamant that he will not be sold during this transfer window. Money talks, though, and it seems only a significant offer could change Aberdeen's thinking. McKenna was on loan at Ayr United last season and seems to have benefitted from that experience. He's been a consistent performer since September last year and his stunning long-range strike against Kilmarnock on Saturday has only added to his reputation. Player sales and Motherwell's run to the League Cup final has lessened the need for the Fir Park club to sell the best of their remaining talent this season. They held out for a sizeable fee from Preston North End for striker Louis Moult before concluding that with the duration of his contract versus the money on the table, the offer was too good to turn down. Hearts had a bid of £100,000 rejected last summer for midfielder Cadden. For a 22-year-old, he has gained a lot of Premiership experience having been a consistent starter and performer for the past two seasons. Manager Stephen Robinson seems determined to retain the player, though, who is contracted until the summer of 2019. "He is a top talent and one of the best young players in Scotland, for me," he said. "He certainly won't be sold for anything under our valuation." There's sure to be interest, but Motherwell's valuation and stance may see him remain at Fir Park.